You may have noticed that I haven’t posted here in a few weeks. Well, there’s a pretty good reason as to why I haven’t shared with you my culinary adventures: I simply haven’t had any. I’m now on a strict diet, due to a health issue, and can’t eat at restaurants as much as I once did (or as much as I’d like to). Basically, I’m on a low-carb, gluten-free diet, which limits the options available to me in this great big city of food. So, what better way to indulge when on such a diet? 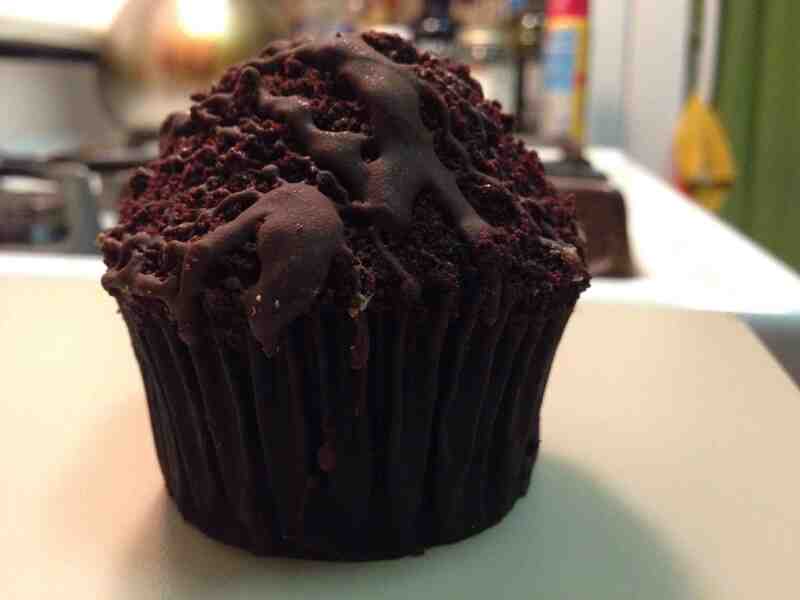 Try a new gluten-free cupcake joint. For the uninitiated, Crumbs has now opened a gluten-free bakery down on 8th street in the West Village. Its sterile interior betrays the warmth and splendor of the baked goods that lie within. With no seats or tables to park at, the gluten-free outpost forces patrons to take their baked goods elsewhere. I have to say, the store itself is slightly unwelcoming, save for the delightful faces of staff who helpfully assist you in buying your sweets. Primarily, this Crumbs sells cupcakes, but they also offer baguettes, quiches, macarons, and other treats to taste. Samples of baguette were carefully cut up and placed upon a platter near the cash register. I tried a piece, and it was pretty good, although the graininess of the bread made it taste less “authentic” than other gluten-free breads I’ve tried. My Dining Partner (MDP) and I selected two small-sized cupcakes: red velvet and blackout. 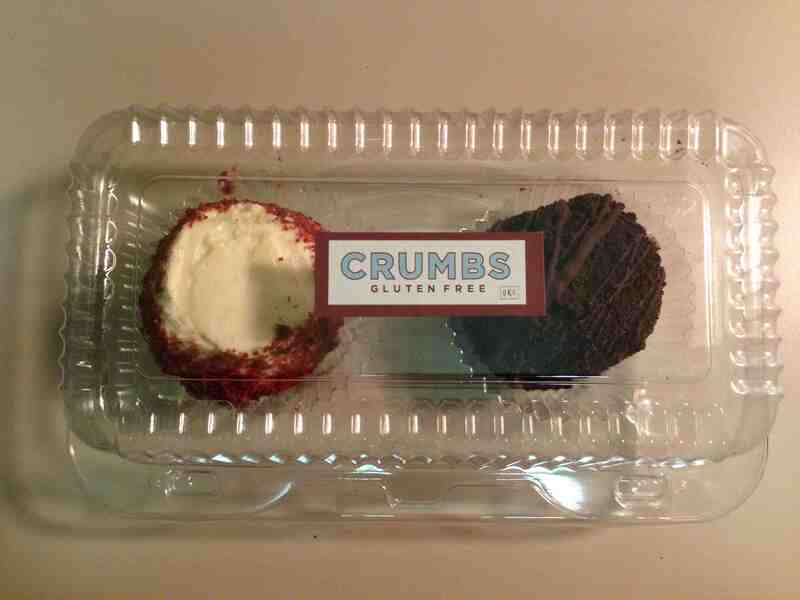 As for the cupcakes, they were pretty good–no, they were better than Crumbs’ typical offerings. If you’ve been to Crumbs, you are familiar with the ultra-sugary, totally gigantic cupcakes they sell. They’re too sweet and too big, and just too much to even try to eat. In my former life, as a gluten-eating person, Crumbs was way down on my list of cupcake shops. But the gluten-free store surely has delivered. The red velvet cupcake was crumbly and sweet enough with a hint of cream cheese in the this-can’t-be-cream-cheese frosting, while the all-chocolate blackout cake was exquisitely frosted and featured the right texture for any cupcake, gluten free or otherwise. Here, at the gluten-free Crumbs, their primary target is obviously Babycakes. And, while I truly enjoyed my cupcake at the gluten-free Crumbs, Babycakes still takes the cake, as it were. Read why here. But, if you’re interested in or need gluten-free confections and don’t want to make the trek all the way down to the Lower East Side, I heartily recommend the gluten-free Crumbs store to satisfy your sweet tooth. Take the N/R to 8th Street. Walk west about a block or so.